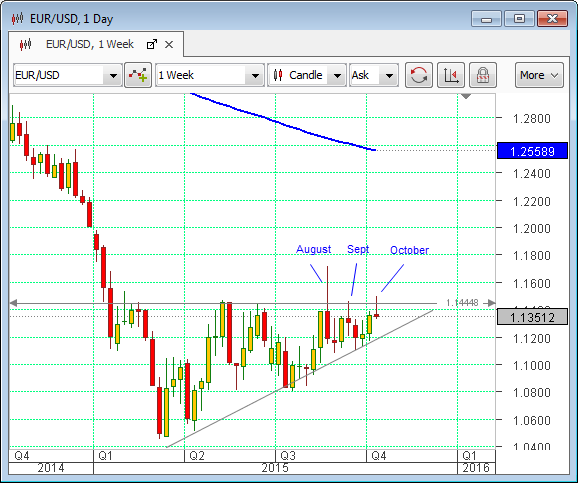 As we pointed out recently, the EURUSD pair has formed a pattern on the weekly chart that would be regarded as significant by Technical Analysis (TA) aficionados. This is called an ascending triangle and can be seen above. Normally, this type of pattern would be regarded as an indication that the instrument in question is going higher, as a continuation of the rising trend of its bottom boundary. Indeed, it is apparent that attempts were made by the pair to break out to the upside in each of the months of August, September and, most recently, this month, October. However, these attempts have been consistently rebuffed. What might be the cause of all this? The most likely explanation is that there is now a competition between two strong forces – firstly, we have the fact that the Euro is now a funding currency for the carry trade, where investors will borrow in Euros (a low interest currency) in order to effectively lend out in other currencies that will give a greater return. The US dollar is moving into this category with the high expectation that the Federal Reserve will raise rates at some time in the not-too-distant future. Secondly, there are now also signs that the Euro has become a safe-haven currency, to be bought when it looks like global stability is threatened. 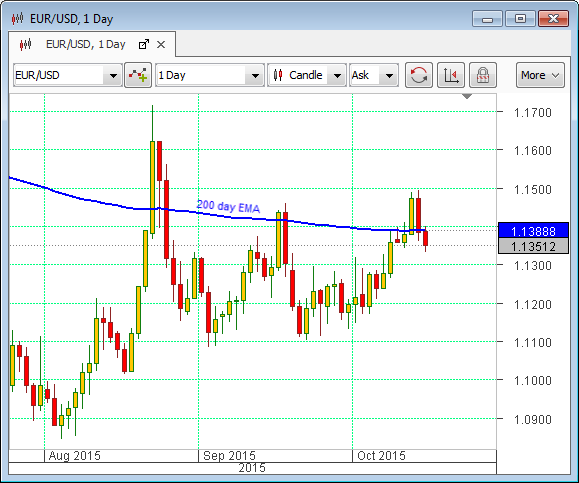 Both of these forces will tend to make the Euro rise against the US dollar. Acting against those tendencies is the fact that the European Central Bank is determined to both raise inflation in the Euro zone (which requires a weak currency) and to keep the value of the Euro suppressed in order to maintain healthy exports. It does this by having officials make comments that will lower the Single Currency, as with the remarks of Ewald Nowotny, the Austrian member of the ECB governing council last week, which caused exactly such a drop. There is also a strong feeling here that the ECB could be active in the currency markets, and that it will soon announce a further acceleration of its Quantitative Easing program, maybe as early as later this week when there is an ECB monetary policy statement due.